The Prince Of Monaco's Palace Tour: Visit Monaco, playground of the rich and famous, for a tour of the opulent palace where film star Grace Kelly once resided. 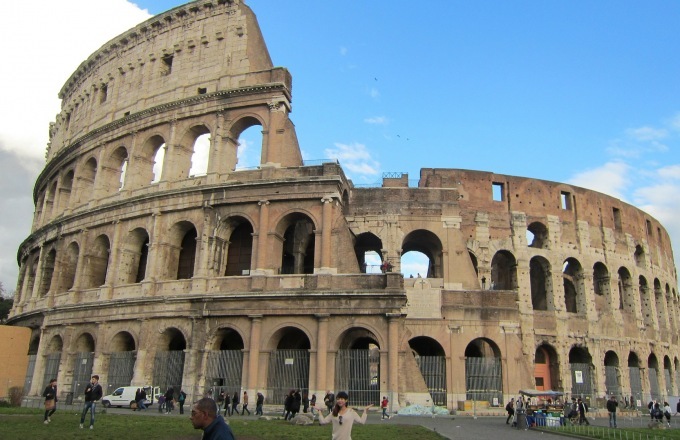 Highlights Of Rome: Take a private tour of Rome's most famous landmarks, including the Colosseum, Forum, Trevi Fountain, as well as the Vatican City Museum and Sistine Chapel. Private Boat To Island Of Capri: On a day trip to the Island of Capri, cruise around the isle on a private boat and swim in the Mediterranean waters. It's an afternoon in paradise. Gelato-Making Experience In Florence: Get a behind-the-scenes tour of the Grom Gelateria! You'll learn how this yummy treat is created and have the opportunity to sample some flavors. Pizza-Making At A Family Farm: See how to press olive oil, make mozzarella cheese and harvest fruit at Agriturismo La Galatea Farm in Sorrento. Afterwards, enjoy a private pizza-making session with the chefs. Enhance your next Disney Cruise Line cruise with Adventures by Disney. You'll discover the best of every port with special guided experiences from Adventures by Disney. Hosted by Adventure Guides, our vacation packages offer VIP experiences and opportunities that immerse your family in the culture and history of the places you visit. Best of all your entire experience will be completely carefree. Begin your unforgettable vacation in beautiful Barcelona. Once on board the Disney Magic® Cruise Ship, enjoy a fabulous lunch. Say "Buenos días!" to your fellow travelers at a private reception that includes the ship's historian, who will regale you with stories about the ports you will experience on your adventure. Participate in a Q&A with the historian and you'll receive the Pin of the Day, a gift for each Adventurer. There's a new pin every day! The afternoon is yours to enjoy—go for a dip in one of the pools or join in some of the shipboard activities. Immerse yourself in the romance of this shining retreat on the French Riviera, nestled between Mont Boron to the west and Cap Ferrat to the east. Visitors thrill at opportunities to sightsee, shop and tour grand landmarks and palaces dating back several centuries, including the picturesque 17th-century harbor. Ride in a luxury coach to the glamorous coastal Principality of Monaco, playground for the world's rich and famous. The towering buildings of Monaco seem to spill from the surrounding mountains into the harbor waters brimming with mammoth yachts. Herein lies the city of Monte Carlo, renowned for its stupendously lavish casinos and ultra-wealthy clientele. See the opulent State Apartments of the Prince's Palace. After the tour, stop for photos on the Palace grounds with the grand marina as the striking background. Discover why Monaco is famous for its cuisine as you indulge in a private rooftop lunch along the Riviera at the Fairmont Hotel restaurant—in the heart of stunning Monte Carlo. Count the gleaming sports cars as they roar past when you stroll the boulevards of this glittering city. Your Adventure Guide will provide postcards and stamps so you can send notes to family and friends back home. The Monte Carlo postmark is a distinctive keepsake! Enjoy the panoramic view of the Mediterranean sea from this medieval village, home to the ruins of a 12th-century castle and the Jardin Exotique, with its graceful statues and fascinating flora. Before boarding the ship, take some time to explore and shop in this historic town. Disembark and board a luxury motor coach for a picturesque ride to the breathtaking city of Florence. Arrive in La Spezia, the capital of the province of the same name, with a population of just over 222,000. Embark on a scenic drive through charming Tuscany to Florence. Discover timeless treasures of the Renaissance on a privately guided exploration designed to enchant travelers of all ages. Marvel at the city's famed Duomo and see the works of masters at the Accademia museum. Stroll along the Ponte Vecchio, a spectacular medieval bridge filled with vendors selling their wares, spanning the Arno River. At the completion of the day's tours, you'll have a wonderful Italian lunch in this scenic city. Please note that this tour includes approximately 1.5 miles (2.4 km) of walking at a steady pace, part of which will be on cobblestones and sometimes uphill. Also, Adventurers who wish to visit churches must remember to cover shoulders and knees before they enter. Take a behind-the-scenes tour of the Grom Gelateria and learn how all that marvelous Italian ice cream called "gelato" is made. Spend the rest of the afternoon exploring the famed streets of Florence at your own pace. Take in some shopping and extra sightseeing before you return to the Disney Magic® Cruise Ship. At the Fountain of Neptune, near the Ponte Vecchio bridge, find a shopping district that rivals any in the world. The order in which port activities occur is subject to change during the day. Civitavecchia, Italy is one of the ports of call on the Disney Cruise Line Mediterranean Cruise vacation and a major point of departure and arrival for travelers en route to central Italy, Sardinia, Sicily, Tunis and Barcelona. With its modern transportation systems, the town is a convenient gateway to Rome, also known as "The Eternal City." A 90-minute ride takes you from the Mediterranean coast into one of the most celebrated cities in the world! Arrive in Rome for a tour, guided by an entertaining expert, that includes a tour of the Vatican City Museum where you will travel through 50 generations of art and civilization. Our privately guided visit includes the wondrous Sistine Chapel—a sight your family will never forget. Learn the legends and relive the majesty of Rome's glorious past on this privately guided tour through history! Marvel at the massive Colosseum, the impressive Forum and the famed Trevi Fountain—where, as legend has it, a coin tossed in the fountain guarantees a return to Rome. Your family will treasure this timeless journey. Take advantage of your last full day on board the dynamic Disney Magic Cruise Ship to enjoy all the activities and venues as well as capture your vacation memories in commemorative photos by our professional photographers. Gather with your fellow Adventurers for a farewell reception followed by a special surprise! After your last breakfast in the magic of the Mediterranean, bid your fellow Adventurers and new-found friends a fond farewell. 5 Breakfast, 5 Lunches and 5 Dinner.